Admission criteria to Diploma/Post Diploma/ Post Graduate Diploma in Engineering, Technology and Management Programs in Polytechnic Institutions affiliated to Board of Technical Education U P shall include the performance in the Joint Entrance Examination, UPJEE(POLYTECHNIC) – 2019. Before filling up the application form, the candidate should have a scanned image of his/her photograph and signature. Just follow the below steps to apply for UPJEE(P) 2019. Step 1 : Visit the official website of Joint Entrance Examination Council, Uttar Pradesh through provide above. Step 2 : Read the instructions carefully and click on the “Online Application Form” button. Step 3 : Apply for Online Registration and choose your Password and note down system generated Application Number. The candidate should supply all the details while filling the Online Registration Form and also required to choose PASSWORD and Security Question and enter his/her Answer. After successful submission of the data, Application number will be generated and it will be used to complete the remaining Steps of the Application Form and also required for all future correspondence. For subsequent logins, candidate will be able to login directly with his/her respective system generated Application Number and chosen Password. Step 4 : Fill Online Application Form and candidate needs to fill up other personal information and choose examination city. ** The scanned images of photograph and Signature should be in jpg/jpeg format only. ** Size of the photo image must be greater than 10 kb and less than 200 kb. ** Size of the signature image must be greater than 4 kb and less than 30 kb. ** Dimension of photograph image should be 3.5 cm(width) x 4.5 cm(Height) only. ** Dimension of signature image should be 3.5 cm(length) x 1.5 cm(Height) only. The candidate has to select Netbanking/Debit/Credit Card option to pay the application fee and follow the online instruction to complete the payment of fee. After successful payment, candidate will be able to print the acknowledgment Page. The candidate has to deposit the application fee through e-Challan mode. As soon as he/she selects, an e-Challan will be generated containing specific details of the candidate along with amount to be paid. The candidate has to take a printout of the same and take it to the nearest branch of the bank for making payment. Step 7 : Download Confirmation Page for future reference and keep it safe. 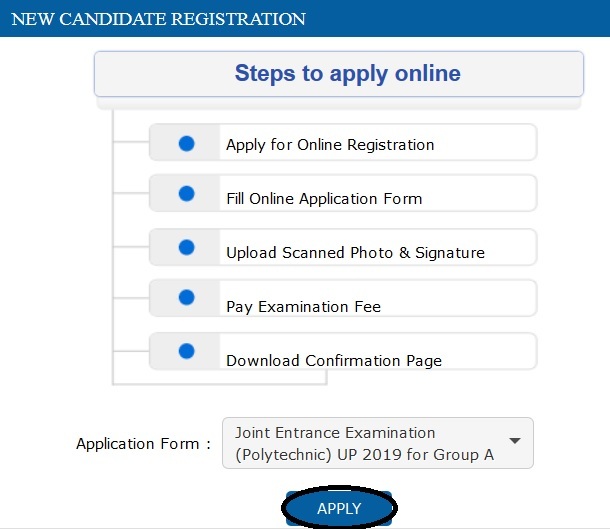 The Admit Card can be downloaded from UPJEE (POLYTECHNIC) website from 3rd week of May 2019 onwards. 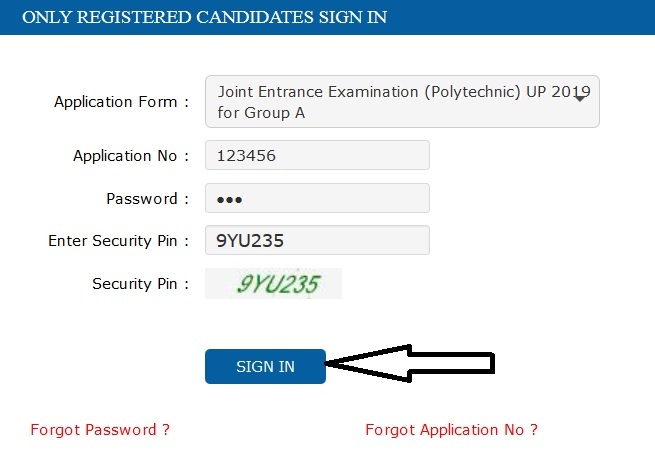 PRIOR TO DOWNLOADING THE ADMIT CARD, The candidates are advised to download their admit cards from UPJEE (POLYTECHNIC) website only. Helpline no. 0522-2630106,2630667,2630678,2630099 Email Id: jeecuphelp [AT] gmail.com will be functional during online application process on each working day from 09.00AM to 06.00PM.